The aim of this book is to make Hippocrates’ On Airs, Waters and Places and the Hippocratic Oath accessible to intermediate students of Ancient Greek. The running vocabulary and commentary are meant to provide everything necessary to read each page. 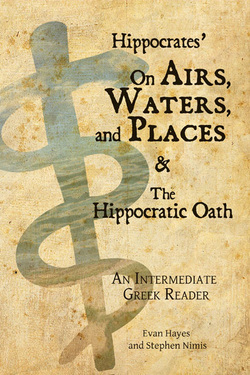 Hippocrates’ On Airs, Waters and Places is a great text for intermediate readers. The simple sentence structure makes it easy to read, while its subject matter, the impact of climate on disease and character, is interesting for a number of reasons. The presentation falls roughly into two halves, the first detailing various environmental factors that contribute to specific diseases, the second more ethnographic in its account of the differences between Asians and Europeans as a function of their environment and customs.